This easy DIY kid craft just uses four things: coloured construction paper, masking tape, scissors and string. Four things, most of us already have in the house! Make a bunch and do them as a Family Day activity (also works great for Father’s Day). Great kid craft for toddlers, pre-schoolers, and big kids alike. Free-hand cut a tie shape (pretty much an hour-glass with a triangle at the bottom). Cut a length of string (not too long and not too short – it’s only decoration). 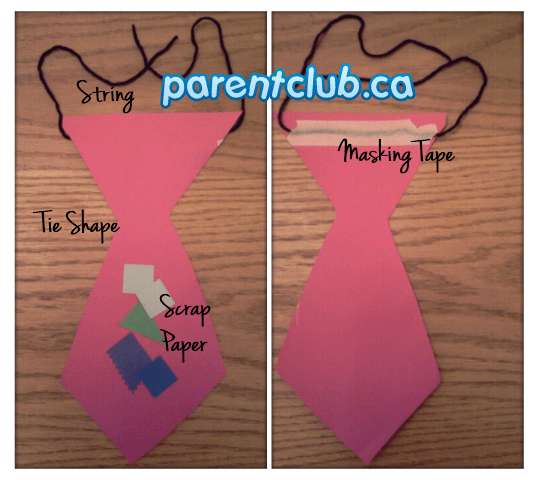 Fix string to back of tie using masking tape. You’re totally right — perfect for father’s day! Looks like a fun craft!